Gumdrop, Griffin, Survivor and many other protective cases for tablets combine extreme ruggedness, shock absorption and drop protection to allow your business’ technology to go just about anywhere, do just about anything, and meet just about any of your needs. Protective cases protect mobile devices from the hazards of drops, shocks and spills, they’ve got you covered. Gripzo has got you covered against unauthorised theft of your valuable business tablet. 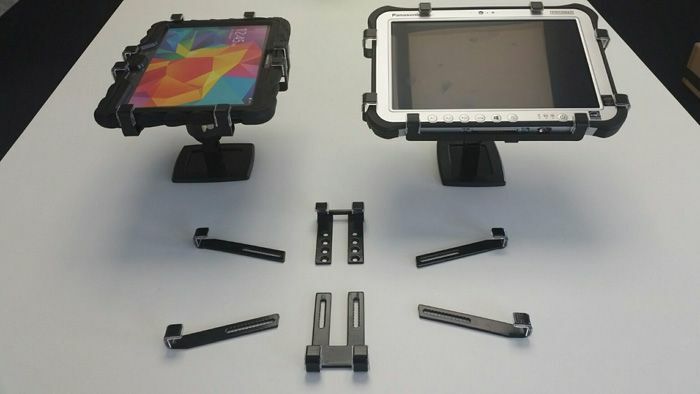 With their unique and easy lock and dock, Gripzo security mounts keep your tablets safe. Gripzo's proposition: quick lock down and quick release when needed. Gripzo is a purely mechanical ‘heavy metal’ rugged security mount in which all tablet sizes fit, with or without protective cases. Gripzo security mounts have exchangeable and adjustable grips to make all mobile devices fit if the right grip set is used. Gripzo security holders can be opened with a security key. If you lose your key, no problem! Changing a lock is easy. You can choose between a security lock and a high security lock with uncopiable patented keys. Gripzo is used all over the world and is considered simple and safe, just the way it should be. Check out our website for more information and find us on Facebook and Twitter.